This week saw me back at hand-quilting my "Sistine Chapel." The design the "Delectable Pathways" design by Mary Sorensen I started several years ago. This week I managed to finish quilting the center panel and am now working my way down one of the side panels. 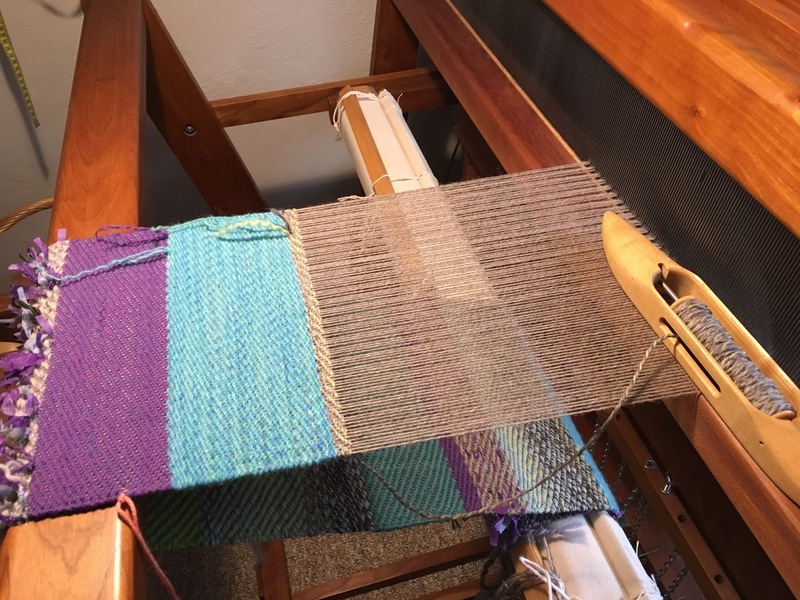 Since I decided to give the scarf I'm weaving to DD, and the loom is operational again, I decided I'd better spend a little time each day working on it. I managed to complete another 12". 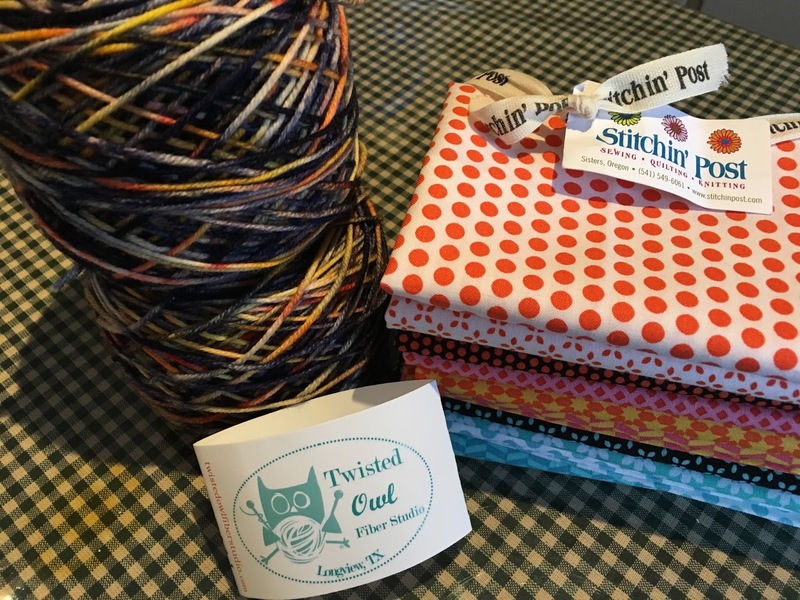 The yarn and fabric I received for Christmas/birthday have been prepared, the yarn for knitting and the fabric pressed to the right size for my fabric stash. Looking at my resident dolls has been making me cold because they have almost nothing to wear, so I decided to take part in a doll KAL (knit-along) on Ravelry in the Debonair Designs for Dolls group. The KAL is for the Polarscape design by Deb Denair. Our contractor came on Thursday to install the cabinets in the hall leading to our master bath. 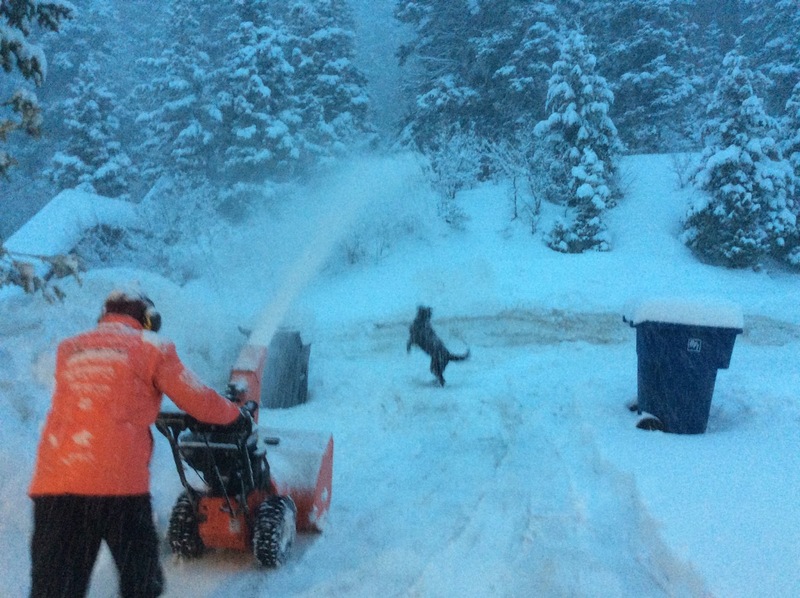 We had a lot of snow, so DH was out early, blowing the driveway to make room for the contractor's truck and providing some entertainment for our neighbors' puppy. Watch is a poodle mix one month younger than Dusty, but still growing. We had to move a bunch of stuff to clear the area where the cabinets would go, so it was a busy couple of days. 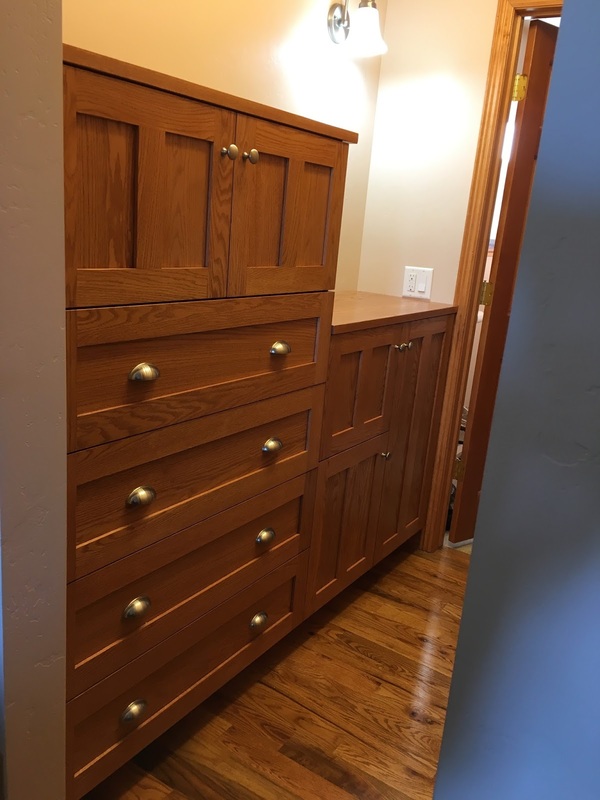 One of the pieces, a side panel for the taller section, was the wrong side, so we still don't have that on, and we're waiting for a mirror with an oak frame that will go over the lower section. This will provide storage for shoes and clothes. The other side of the hallway is taken up with closet with sliding doors. 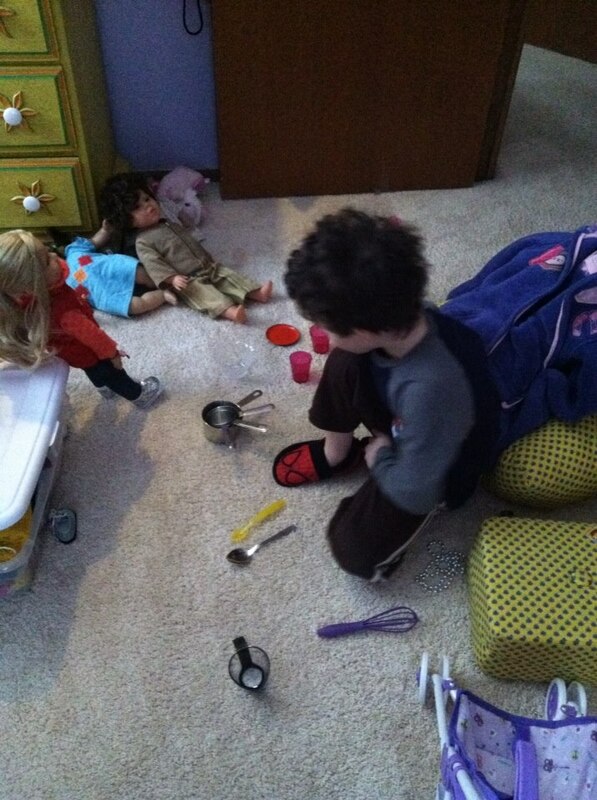 For this week's cuteness, here's a photo of Zachary, making breakfast for Zachary Jr. and Hannah. He will be a good daddy someday. He's so happy to have his own doll. 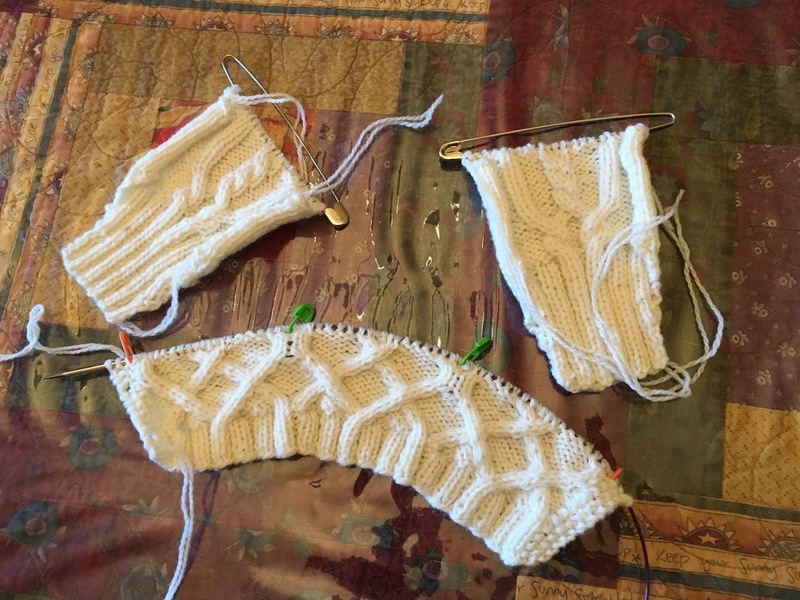 What's on my needles: The Polarscape doll sweater, getting close to joining the sleeves to do the yoke. What's on my Featherweight: Still waiting for a new assignment. What's on my loom: Progress on the scarf for DD. What's on my wheel: Stanzi is set up again with more Full Circle spinning fiber, no progress, however. What's on my iPad/iPhone: Finished Agatha Raisin and Quiche of Death by M. C. Beaton, then The Little Paris Bookshop by Nina George, both from Audible. I would describe the second book as a poetic emotional roller coaster, well written and full of sensory input. Finished Lord Haversham Takes Command by Heidi Ashworth on the Kindle app. There were a lot of grammar/typesetting errors, but the story was interesting. Nothing new started yet. What's in my wine glass: Big House "Prohibition Red" 2015, by the box. It will probably take us a week to get through it. At least it doesn't go off in the box. 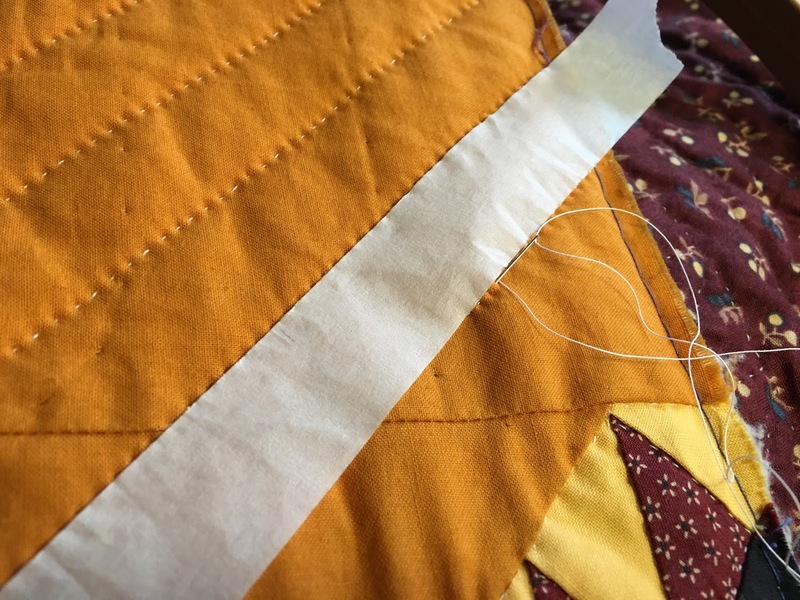 What's my tip of the week: Hand-quilting a quilt with long straight lines doesn't require drawing on the fabric, if your long straight lines are as far apart as a strip of masking tape. It's best to leave the tape off when you stop quilting, but I haven't had it leave any sticky residue so far. The same strip can be used several times. 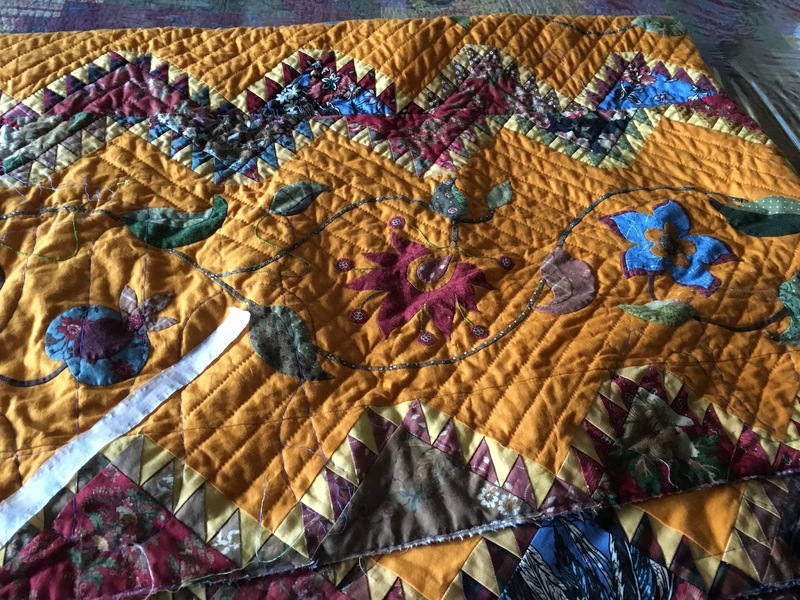 I've found that the quilting is smoother if you always sew in the same direction, rather than going up one row of stitches and down the next. Zachary has two great role models for parenting. DD and her husband waited until they were older to settle down and have a family. (They were both pursuing advanced degrees.) We feel very fortunate that our grandchildren have stable homes with great role models. Zachary is a doll himself! Apparently he has a good role model for his parenting skills. Those cabinets are beautiful. Shannon, I agree. However, some boys are not drawn to dolls, and some girls don't care about trucks. All children should have access to a variety of toys, though, so they can find out what they like. so nice to see small children not stereotyped. my kids, boy and girl, were both raised with lego and dolls. today they are happy thriving young adults. the toys were not thrust upon them, but a plethora of options was always available. it's all about exposure. i feel sad to see little boys given vehicle toys all the time, and girls with dolls and princess stuff. so limiting. btw the fibre arts are nice too! I tried the 1/4" masking tape, but it kept coming off. It wasn't wide enough to stay put. Then I realized all I had to do was measure 1/4" from the last quilting line and stick the tape there. I put ball-headed pins in every few inches. I'd love to see a video demo of you working the loom. Fascinating. The cabinets look beautiful. Great use of space - organizational and functional. I love masking tape for hand quilting lines. And it comes in widths from 1/8" to about 3" wide.